Matador Goods editor Lola Akinmade chows down on decadent fine art in Dublin’s 5-star Merrion Hotel. I’D JUST STUFFED my mouth with another freshly baked currant scone loaded with clotted cream, tart yellow lemon curd, and seedy homemade raspberry jam when a white porcelain tray holding three vibrantly colored mini desserts was immediately placed in front of me. Still working on the second tiered tray of tea desserts which included said scones, mini portercakes, and checkered Battenberg cake, I quickly realized the final act was yet to come. My tray of scones was swiftly replaced with a more elegant art tray which I was initially afraid to defile with my fork. 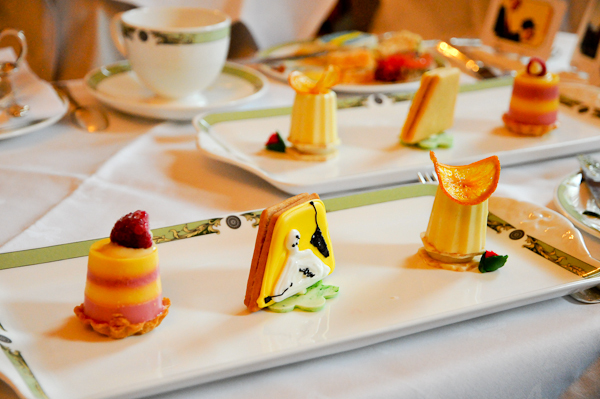 As a guest of The Merrion, one of Dublin’s 5-star luxury properties whose frequent guest list reads like closing credits from a star-studded Bond movie, I’d been invited to taste its newest collection of art served alongside traditional Irish Afternoon tea. Merrion owns the largest private art collection in Ireland, representing over 40 Irish Artists such as John Boyd, May Guinness, Patrick Hennessy, Stephen McKenna, Jack B. Yeats and William Scott. Their paintings hang all over the 18th century Georgian style hotel with its matching period furnishings. 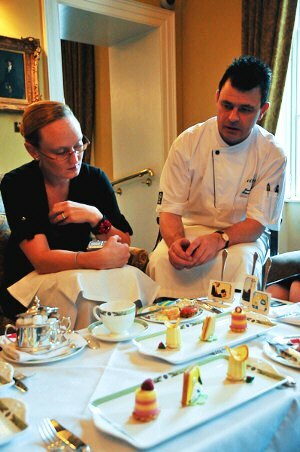 Challenged with keeping the hotel’s classic afternoon tea service fresh, Executive Chef Ed Cooney needed inspiration for a new menu. John Boyd “Futile Defense” interpretation. 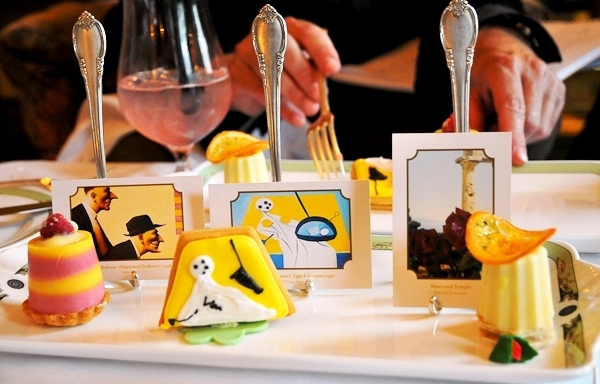 Surrounded by striking paintings which seem taken for granted and relegated to background décor, he developed miniature pastry creations inspired by the paintings themselves. According to Cooney, this process was a year-long journey of studying the intricacies and styles of various artists currently being exhibited in-house, then extrapolating their artwork into tailored edible art with various shapes, textures, and consistencies. 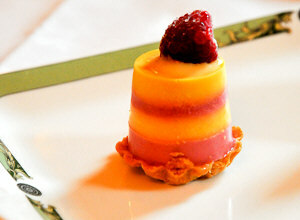 For example, artist John Boyd’s famous painting “Futile Defense (Fabricated Evidence)” and its pink/yellow stripes on the right was deconstructed and interpreted into a raspberry & passionfruit custard tart; extracting the artist’s surrealism. With artist William Scott’s painting, “Frying Pan, Funnel, Eggs, & Lemons” (pictured below), Chef Cooney pulled out shapes and objects to create an orange curd filled trapezoid-shaped vanilla biscuit. Balancing the tray of art pastries with the right texture and colors was also as important as preparing each tart or biscuit. Artist William Scott’s “Frying Pan, Funnel, Eggs, & Lemons” painting. As an artist myself, I fully understand how subjective fine art is and how trying to visually connect with a particular painting can sometimes seem like a stretch, so I thanked Chef Cooney gratefully for beautifully translating abstract paintings into a form I understood quite well: delicious food. Chef Ed Cooney explains each piece. The pastry collection is still a work in progress and barely a year old. 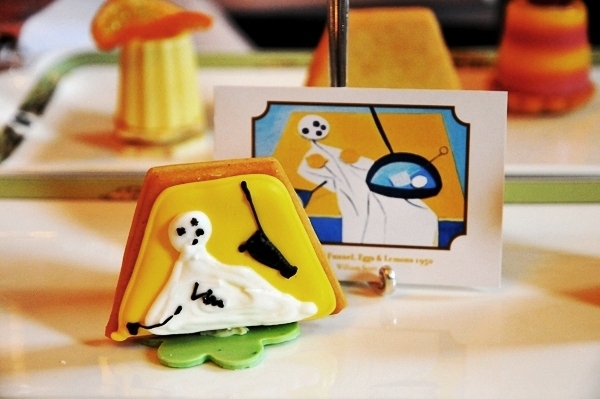 Chef Ed Cooney and his team have created nine mini desserts so far, and are aiming for 12 miniature art pieces that would be rotated 3 at a time on a weekly basis every month. Before each of the current nine pieces was completed, it underwent a series of evolutions to achieve the right balance of texture, taste, color, and consistency. According to the Merrion, feedback from the cultural community within Dublin has been amazingly supportive. Since several of the artists are still living, the hotel works closely with them to make sure Chef Cooney’s interpretations aren’t violating any intellectual property rights. “The collection is timeless, can stand on its own, and is unique to the Merrion,” adds Cooney. Frankly, I think it’s a scrumptiously ingenious idea. 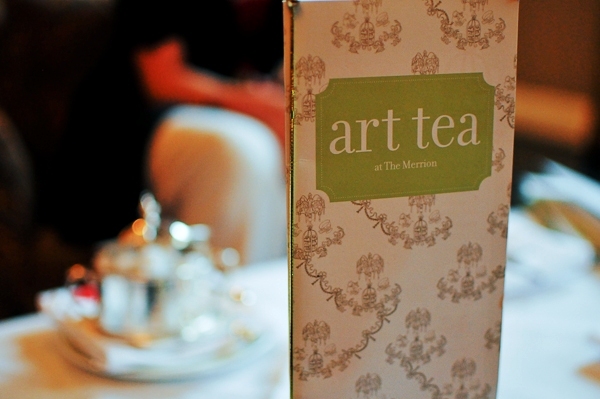 Art Tea at The Merrion is served daily from 3pm to 6pm in one of The Merrion’s drawing rooms. It costs €36.00 per person, and includes a complimentary art catalog that guides you through the hotel’s art collection. Not all desserts can live up to Chef Cooney’s standards, but if you can’t make it to Dublin, maybe you’d be interested in a Dessert Lover’s Guide to New York City or Inside a Chinese Bakery: From Buns to Tarts. Or if roughing it is more your speed, how about Delightfully Delicious Campfire Desserts?